1- Andrés Jiménez (Puertollano): Hola Rafa. 250,000 people have evacuated in the metropolitan area because of Hurricane Irene. Are you afraid like Federer how hard it will strike? Were you able to train normally? Has ATP communicated some plan about evacuation? Rafa: Hi Andres. At the end it was not as great as expected, at least here in Manhattan. It was bigger in other places and there were even death. The U.S. Open reported that all facilities would be closed and we could not go. We were recommended to stay in hotels. Better safe than sorry .... I trained yesterday and today as normal and let the first round. 2. Daniel Muñoz (Sonseca): How are facing a U.S. Open in these conditions when Manhattan looks like everything is closed? Is it true that the question most repeated by few players, coaches and family members who were at Flushing Meadows is: "What floor are you?" Have you played any other tournament in a similar situation? Rafa: It was strange but I was training well so nothing bad come from a day off. The truth is that we had never experienced anything like this. 3. Leticia García. (Madrid): Hola Rafa champion. It seems you also like the Japanese tepanyaki like me. I have read the blisters on the hands were bandaged were not important but is the foot problem better? Can the left foot affect you at Flushing Meadows? Congratulations and keep it up as the humble champion of world of tennis. Rafa: All is well, fingers are already better and feet is not giving me any problems either. We are well to compete, now need some luck and everything will go well. 4. Rafael Moyano (Madrid): Hola Champion, how great you are. Have you been able to train these days of rest on all things you want to refine in your game? What will you do in your free time in New York because you can hardly get out?. 5. Marga García Martínez: Hola Rafa. Federer gave us a great match against Djokovic at Roland Garros and then found you in the end .... But he begins to doubt his ability to win big at 30 because you are you and Djokovic. Do you think Federer can again reach the regularity in his game and win titles like other times? Thanks for answering, you're a great guy. Rafa: Federer is Federer and he is always there. This surface is good for him and he's certainly a serious candidate to win the title. How many times was he given up on and there he is! Thank you for your words! 6. Irene Puigi (Barcelona): Hello sky, I wanted to ask you. We hope to see you again very happy on the court. I wish you the best in the world. Have you rested all you want on your vacation? During these type of tournaments do you follow regular Liga matches or only of Real Madrid. Rafa: I rested very well this holiday with my friends. I needed it, really. As regards the League, I think there are few who watch as many games as I do. I love football and try to see almost every game, whether it is The Mallorca, Madrid and Barca, always watch them! 7. Luis Muniesa (Málaga): Hola Rafa, good luck for this new challenge. I wanted to ask about Murray, takes two years, although he is regular throughout the year provided the finale is that is out and it looks like next year is going to really break ... What do you think that is? Thank you and very careful with Irene! Rafa: Murray is a very talented player and he would soon win a Grand Slam tournament. It has everything to do so. 8. Fran Solana (Alicante): Hola Superchampio. I'm not going to ask you about courts. What movies and books you've read and watched this summer, to recommend it to your thousands of fans? 9. Carmen González (Badajoz): I hope you've rested enough and the physical problems move away and they leave to see your better tennis. What are the prior sensations before this U.S. Open? How do you see the rest of the Spaniards? Still pouring hours of play as before? Rafa: I am well and hope and eager as ever to go out and give everything. Then you never know whether to go or not. It also depends on the rivals. At the play I have not played on this tour. I have not played since Wimbledon. 10. 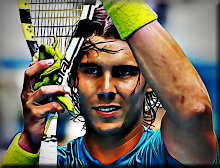 Miriam Vázquez: Grande Rafa, every day I like how you know better fit defeats. Djokovic retired with shoulder problems to Murray in the final in Cincinnati and recently lost Cincinnati. He says he's already recovered. Do you think he can maintain the same level or is impossible to maintain these states so long? Rafa: Djokovic is at a breathtaking moment and the question that everybody keeps asking is if he could continue that pace. It is very difficult to do what he has done. I think this question will have an answer on September 12. Elmundo is in Spanish please send Rafa your questions there.